NTT Communications has established a new strategic partnership with FireEye to provide advanced security defense and response capabilities in Japan. The companies aim to counter highly sophisticated attack groups use custom-malware, compromised credentials and social engineering to bypass traditional signature-based defenses. NTT Com will offer the complete FireEye product suite via its WideAngle Managed Service, augmenting its existing security capabilities with FireEye’s MVX technology, threat intelligence and expertise to reduce security threats from targeted attacks and advanced persistent threat groups. This includes Real Time Malware Detection "RTMD" to identify previously unknown malware using the FireEye MVX engine, a virtual environment that detects and analysis unknown malware through multiple vectors including, network traffic, email and endpoints. When a threat is identified, RTMD can isolate the malware and block any outbound communication triggered by an attack. Once an attack is identified, NTT Com will manage the response to determine the extent of an attack and use FireEye Threat Intelligence to help identify if an advanced attack group was involved with the operation. As part of this service, NTT Com will help prevent further damage or data exfiltration in the clients’ ICT environments, this protection extends to endpoints, a common attack vector. In January 2015, NTT Communications began offering a software security appliance service that can be deployed in a customer’s private cloud, and in the near future via NTT Com’s WideAngle security service for managed security. The service, which is offered in collaboration with Fortinet, enables the on-demand use of basic security functions, such as cloud intrusion prevention system (IPS) and filtering, for the unprecedentedly fast, flexible and low-cost implementation of security measures. NTT Com is the world’s first telecom service provider to launch a one-stop service for managed security service using Fortinet’s software security appliance. It is being offered as a new option in NTT Com’s Enterprise Cloud service for mission critical systems. 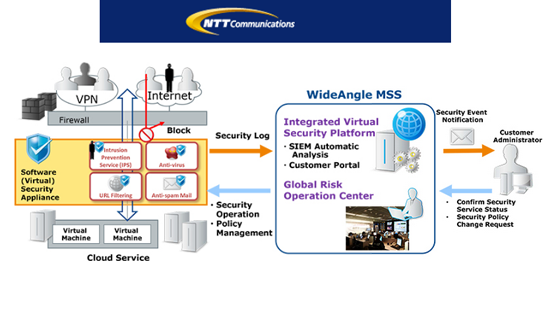 NTT Com Security (formerly Integralis) introduced its next generation Managed Security Services (MSS) for global enterprises. NTT Com acquired Integralis in 2009. The enhanced MSS, which is available under the company’s single global brand, WideAngle, is capable of analysing vast amounts of disparate data and distilling it into actionable information that enables businesses to manage increasingly diverse threats and make informed risk management decisions. The new service has three key building blocks – device management, automated analysis and security enrichment – and is delivered by NTT Com Security experts through its Global Risk Operations Centres (GROC). The 24/7 service is available in five different service levels.